Hello Power Poppy friends!! Today is the first day of 8 days of previews and then a final hop on the 9th day!!! That is a LOT of Power Poppy goodness to take in, so I hope you're ready for the ride!! 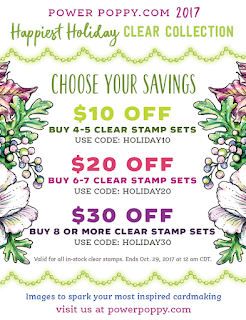 Marcy has pulled out all the stops with these designs, and the Bloom Brigade is in full force with gorgeous samples!!! 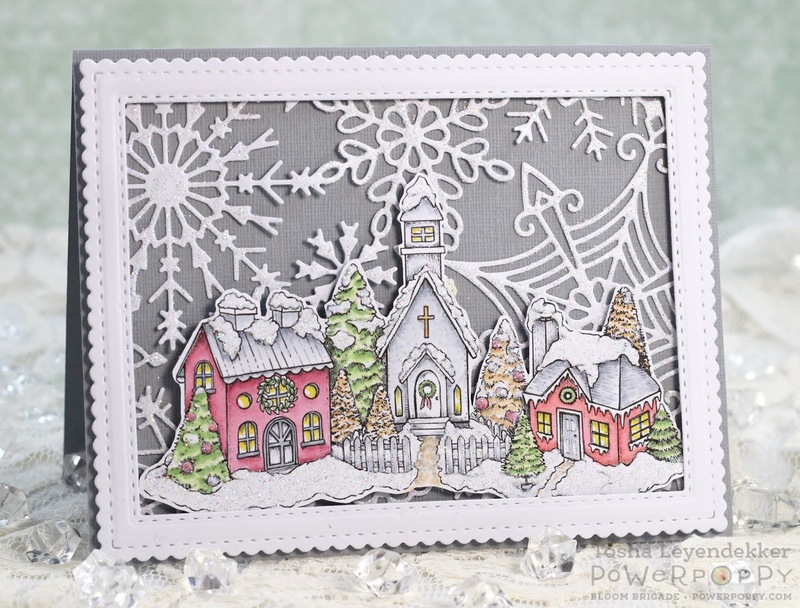 Today we're starting with a set called Snow Kissed. Isn't that sweet?!?!? Its two main images are a snowman and a stuffed stocking. But Marcella didn't stop there. She added a fantastic variety of filler images as well as some beautifully fonted sentiments. 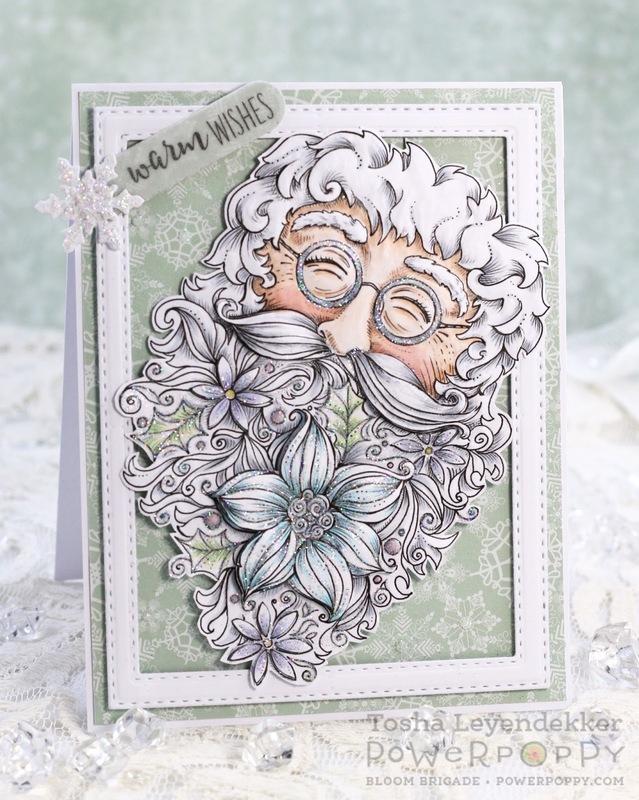 I chose create a card with the stocking as the focus, along with a sweet "Merry Moments" sentiment. The word "Merry" looks cross-stitched, so I dotted the stitching with a red Copic to highlight it. That's it for today's project. Be sure to visit the following Bloom Brigade Blogs for some more inspiration. Tomorrow I have a Minc'd project to share with you, so I hope you'll stop by. So fun!! Happy Friday my creative friends!! I have to tell you, I am feeling so very thankful today. I LOVE my family! I LOVE my church!! 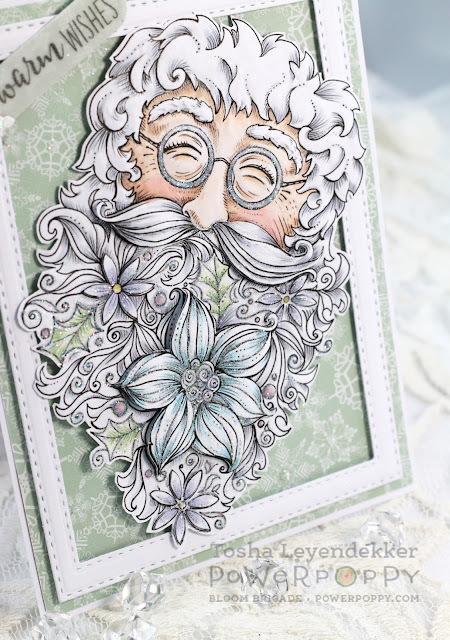 I get to design with the absolutely most wonderful and talented paper crafters, and for the sweetest and ultimate artist! And, although we are suffering with really poor air quality, due to so many surrounding fires here in California, we are safe and blessed! There are so many who need prayers in our state right now though: Those who have lost homes and property and those who are fighting to save what they can. So, if you can, please take a moment to remember all those who are suffering from natural disasters, at this time, all over the United States and World. Unfortunately, there are so many! Now, onto my card for today...I needed some Thank You cards for some incredible ladies who helped me decorate our church for a large Women's event this past weekend. Fortunately for me, Power Poppy has many stamp sets that can be used for Thank You's. 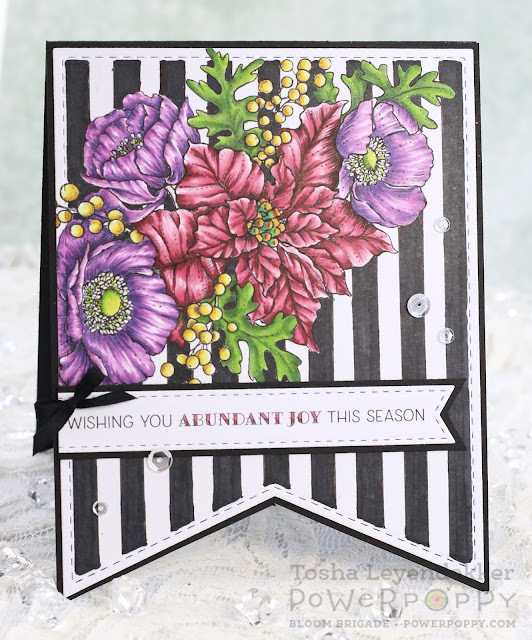 Our sweet and talented Bloomie Stacy, has challenged us to make Mini cards this month for our Power Poppy Power and Spark Challenge. So I decided it would be fun to make mine an Easel Card. Here's a link to an Easel Card Tutorial on Splitcoaststampers. I colored my image, from Feeling Fall, with Copics, cut it out, and adhered it to a piece of decorative paper that I stamped the image on also so I had an already made background. I didn't want to tackle cutting out the berries. 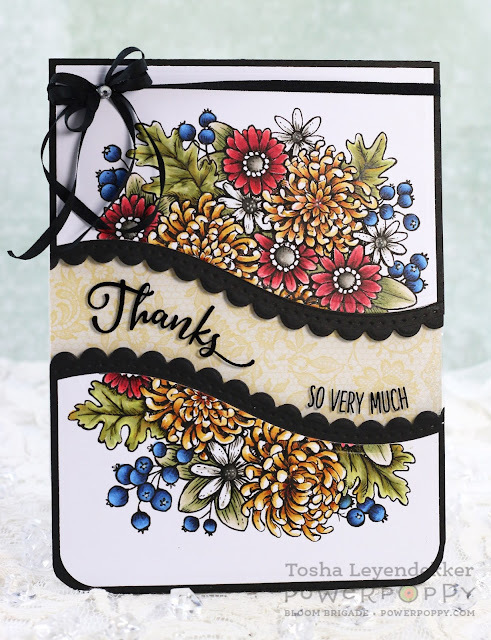 haha The sentiment is from Power Poppy's So Grateful clear stamp set. Hello creative friends!!! I have a Power Poppy card to share with you today that I made using the new digital image called Autumn's Opulence. It has such a beautiful variety of flowers and was a delight to color, let me tell ya!!! 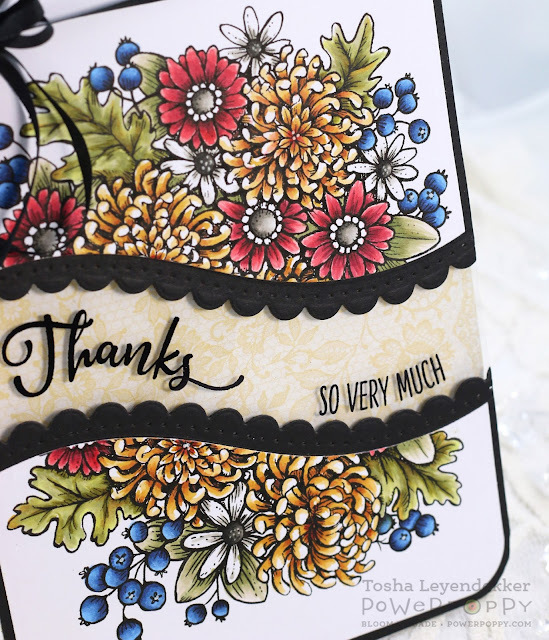 I thought it would be fun to leave some negative space by dividing the image, and and then Minc'ing the sentiment (from Power Poppy's Vibrant Thanks set) onto Acetate. I adhered the acetate to the back of the flower panels and then popped it up over the yellow dp. I love the shadows the sentiment gives over the background. It's kind of like a floating sentiment panel. Super fun!! 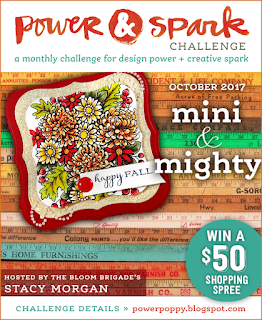 We also have a new Power & Spark Challenge for this month, hosted by our super sweet Bloomie, Stacy!!! 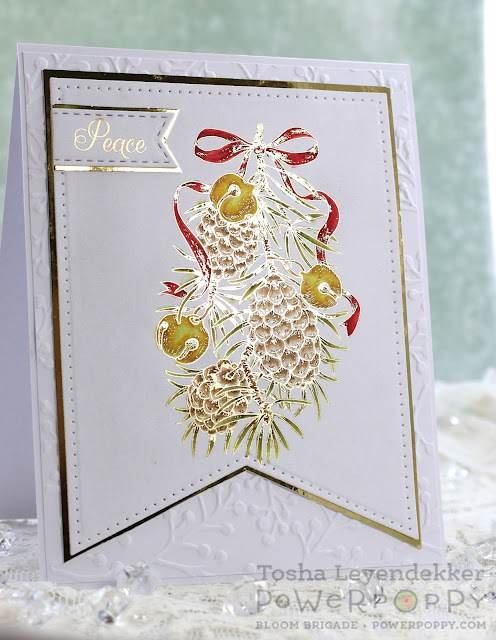 All you have to do is create a mini-note/card that is smaller than 4". That's it. 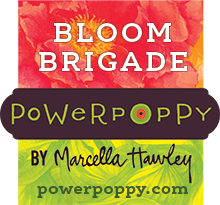 And if you link it up at the bottom of the Power Poppy Power and Spark Challenge Post, you will be entered to win a $50 Power Poppy shopping spree!! For real!!! That is quite the deal!! So I hope you'll join in on the challenge! That's if for me today y'all!! I hope you have a fabulous weekend! !